Just before its launch in New York on September 20th, the Canadian Government agreed to be a signatory of the Open Government Partnership (OGP). Composed of over 40 countries the OGP signatories are required to create a list of commitments they promise to implement. Because Canada signed on just before the deadline it has not – to date – submitted its commitments. As a result, there is a fantastic window for the government to do something interesting with this opportunity. Before diving in, it is worth letting readers know that there are some criteria for making commitments. Specifically, any commitment must tackle at least one of the five “core” challenges: improve public services, increase public integrity, more effectively manage public resources, create safer communities, and increase corporate accountability. In addition, each recommendation should reflect at least one of the core OGP principles, which are: transparency, citizen participation, accountability, and technology and innovation. Having reviewed several other countries commitments and being familiar with both what Canada has already done and what it could do, attached are 10 commitments I would like to see our government make to the OGP. Obviously there are a number of commitments the government is going to make since they are actions or programs that government was going to launch anyways. In addition, there will be some that will be new ideas that public servants or politicians have been looking for an opportunity to champion and now have an excuse. This is all fine and part of the traditional way government works. But wouldn’t it be nice if – as part of the open government partnership – we asked citizens what they thought the commitments should be? That would make the process nicely consistent with the principles and goals of the OGP. Thus the government should launch a two week crowd sourced idea generator, much like it did during the Digital Economy consultations. This is not suggestion that the ideas submitted must become part of the commitments, but they should inform the choices. This would be a wonderful opportunity to hear what Canadians have to say. In addition, the government could add some of its own proposal into the mix and see what type of response they get from Canadians. At this year’s open government data camp in Warsaw, the always excellent Tom Steinberg noted that creating a transparent government and putting in place the information foundations of a digital economy will be impossible unless access to government data is not a gift from government (that can be taken away) but a right every citizen has. At the same time Andrew Rasiej of Tech President advocated that we must redefine public as digital. A paper print out in a small office in the middle of nowhere, does not make for “public disclosure” in the 21st century. It’s bad for democracy, it’s bad for transparency, and it is grossly inefficient for government. a) Any document it produces should be available digitally, in a machine readable format. The sham that the government can produce 3000-10,000 printed pages about Afghan detainees or the F-35 and claim it is publicly disclosing information must end. b) Any data collected for legislative reasons must be made available – in machine readable formats – via a government open data portal. c) Any information that is ATIPable must be made available in a digital format. And that any excess costs of generating that information can be born by the requester, up until a certain date (say 2015) at which point the excess costs will be born by the ministry responsible. There is no reason why, in a digital world, there should be any cost to extracting information – indeed, I fear a world where the government can’t cheaply locate and copy its own information for an ATIP request as it would suggest it can’t get that information for its own operations. As a leader in the field of resource extraction it is critical that Canada push for the highest standards in a sector that all too often sees money that should be destined for the public good get diverted into the hands of a few well connected individuals. Canada’s reputation internationally has suffered as our extractive resource sector is seen as engaging in a number of problematic practices such as bribing public officials – this runs counter to the Prime Minister’s efforts to promote democracy. As a result, Canada should sign, with out delay, the Extractive Industries Transparency Initiative, much like the United States did in September. This can help signal our desire for a transparent extractive industry, one in which we play a significant role. Canada has already taken significant steps to publishing its aid data online, in machine readable formats. This should be applauded. The next step is to do so in a way that conforms with international standards so that this data can be assessed against the work of other donors. The International Aid Transparency Initiative (IATI) offers an opportunity to increase transparency in foreign aid, better enable the public to understand its aid budget, compare the country’s effectiveness against others and identify duplication (and thus poorly used resources) among donors. Canada should agree to implement IATI immediately. In addition, it should request that the organizations it funds also disclose their work in ways that are compliant with IATI. 5. Use Open Data to drive efficiency in Government Services: Require the provinces to share health data – particularly hospital performance – as part of its next funding agreement within the Canada Health Act. Comparing hospitals to one another is always a difficult task, and open data is not a panacea. However, more data about hospitals is rarely harmful and there are a number of issues on which it would be downright beneficial. The most obvious of these would be deaths caused by infection. The number of deaths that occur due to infections in Canadian hospitals is a growing problem (sigh, if only open data could help ban the antibacterial wipes that are helping propagate them). Having open data that allows for league tables to show the scope and location of the problem will likely cause many hospitals to rethink processes and, I suspect, save lives. Open data can supply some of the competitive pressure that is often lacking in a public healthcare system. It could also better educate Canadians about their options within that system, as well as make them more aware of its benefits. In an era where online identity is a problem it is surprising to me that I’m unable to locate a database of expired social insurance numbers. Being able to querry a list of social security numbers that belong to dead people might be a simple way to prevent fraud. Interestingly, the United States has just such a list available for free online. (Side fact: Known as the Social Security Death Index this database is also beloved by genealogist who use it to trace ancestry). The only time the public finds out about a product recall is after someone has died. This is a terribly tragic, not to mention grossly inefficient, outcome. Indeed, the current approach is a classic example of using 21st century technology to deliver a service in a 19th century manner. If the government is interested in using the OGP to improve government services it should stop just issuing recall press releases and also create an open data feed of recalled products. I expand on this idea here. If the government were doubly smart it would work with major retailers – particularly in the food industry – to ensure that they regularly tap into this data. In an ideal world any time Save-on-Foods, Walmart, Safeway, or any other retailers scans product in their inventory it would immediately check it against the recall database, allowing bad food to be pulled out of production before it hits the shelves. In addition, customers who use loyalty cards could be called or emailed to be informed that they had bought a product that had been recalled. This would likely be much more effective than hoping the media picks the story up. For almost a year the UK government has published all spending data, month by month, for each government ministry (down to the £500 in some, £25,000 in others). More over, as an increasing number of local governments are required to share their spending data it has lead to savings, as government begin to learn what other ministries and governments are paying for similar services. Another bonus is that it becomes possible to talk about the budget in new and interesting ways. 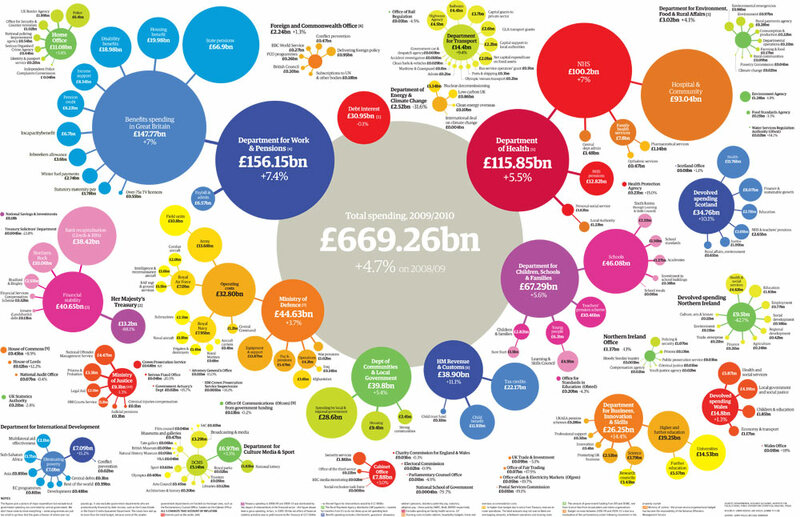 This BEAUTIFUL graphic was published in the Guardian, while still complicated it is much easier to understand than any government document about the budget I have ever seen. 9. Allow Government Scientists to speak directly to the media about their research. It has become a reoccurring embarrassment. Scientists who work for Canada publish an internationally recognized ground break paper that provides some insight about the environment or geography of Canada and journalists must talk to government scientists from other countries in order to get the details. Why? Because the Canadian government blocks access. Canadians have a right to hear the perspectives of scientists their tax dollars paid for – and enjoy the opportunity to get as well informed as the government on these issues. Thus, lift the ban that blocks government scientists from speaking with the media. 10. Create a steering group of leading Provincial and Municipal CIOs to create common schema for core data about the country. While open data is good, open data organized the same way for different departments and provinces is even better. When data is organized the same way it makes it easier to citizens to compare one jurisdiction against another, and for software solutions and online services to emerge that use that data to enhance the lives of Canadians. The Federal Government should use its convening authority to bring together some of the countries leading government CIOs to establish common data schemas for things like crime, healthcare, procurement, and budget data. The list of what could be worked on is virtually endless, but those four areas all represent data sets that are frequently requested, so might make for a good starting point. This entry was posted in canadian politics, cool links, free culture, open data, public policy, public service sector renewal, technology and tagged accountability, canada, cdnpoli, OGP, opendata on October 25, 2011 by David Eaves. THis is great, I would add along with the CIOs for point 10, I would add data librarians and geomaticians, that have the expertise to catalog and manage data and have a proven track record. CIOs can give the ok but the expertise on standardization should come from those who actually have to do this job and have done it well for for decades. I would also add investing in a non-partisan civil service capable of conducting and carrying out analysis on data collected in the public interest. Transparency is critical, but capacity to perform research is compromised by the failure to invest in adequate staffing in this element of the public service. People can write database apps “socially” by typing Executable English knowledge into a browser, using their own words, jargon and phrases. Then, they can run their apps over large networked databases, and get English explanations of the results. Think evidence-based medicine, food security, energy independence, etc. You can Google Executable English to find this, or go directly to http://www.reengineeringllc.com . Shared use is free, and there are no advertisements.